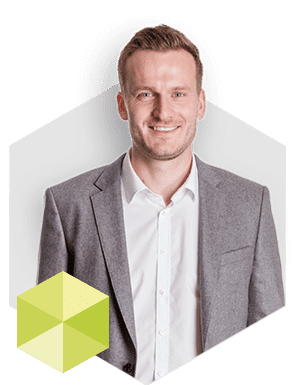 "Now we can process complaints of partners, recipients and customers much more efficiently and clear them faster [...] Thus we are constantly improving our processes." Forwarder Amm relies on video surveillance with scanner locating, which also enables the subsequent volume calculation of individual shipments. Cubage or tonnage: Not only on the weight, but also on the volume of the goods it depends on what basis a freight will be billed. For bulky goods, the actual consignment dimensions are therefore an important information, which is not always stated correctly on the accompanying documents. Thus, the receivers of the general cargo networks lose high revenues every day, which is particularly painful given the already tight margins. The situation is similar in the direct relationship between freight forwarders and shippers. Some logistics service providers have therefore invested in calibrated volume measurement systems. For measurements with these systems, however, the loading process must be interrupted. As a consequence of permanent deadline pressure and high loading volumes, the time-consuming procedure is mostly only used for random sampling or measurements in case of suspected discrepancies. The same applies to manual re-measurement with a ruler. The Nuremberg based Amm forwarding agency now has quite another solution for this problem, which does not interrupt the loading process and can calculate the volume of a shipment only with the help of a photo. The innovation is called Scale+ and works even when the goods have already left the warehouse. In addition, the volume control is conveniently done on the PC screen, where the contours of the package are traced on a photo using the mouse. On this basis, Scale+ calculates the volume and visually compares the actual values with the target values stored in the forwarding software. The result can then be exported as a PDF or JPG file for easy proof to the partner forwarder. 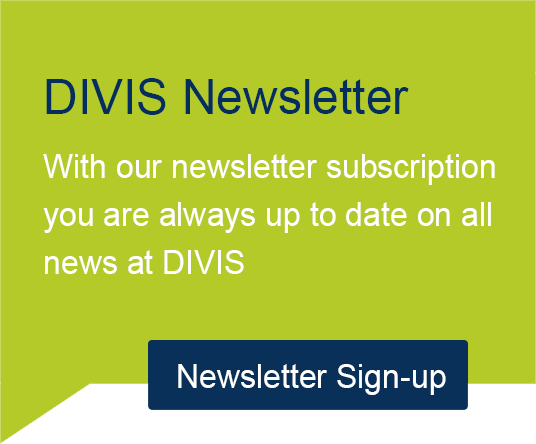 Scale+ is a Plus+ function (add-on module) of the DIVIS-developed video surveillance solution CargoVIS, which has been in use at Amm since January 2018. Amm did not only decide for DIVIS due to the sophisticated technology and the unique volume calculation system, but also because of the existing references. 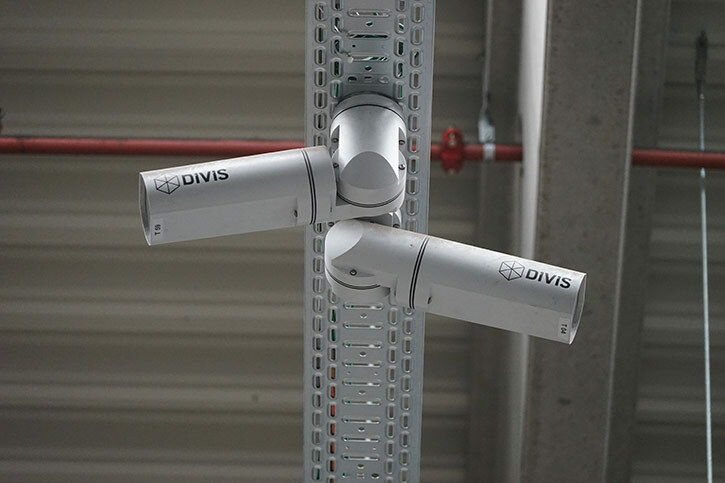 "DIVIS has a lot of experience with large projects," says quality manager Andreas Wegner, who is very satisfied with the introduction phase of CargoVIS: "The installation was quick and noiseless." Even subsequent and short-term changes in the order size have been implemented by DIVIS without any problems, he notes. With 84 indoor and 23 outdoor cameras CargoVIS captures the entire premises at the headquarters of Amm. Through intelligent interaction with the handheld scanners used for shipment handling in the hall and short-distance transport, the image material created around the clock is enriched with reference points, which make it possible to locate individual shipments at the push of a button. 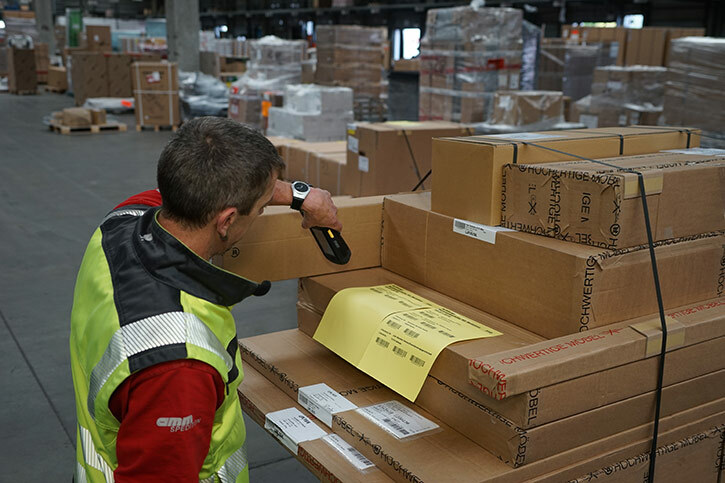 Reference points are created with every barcode scan and include not only the time and the shipment number but also the location of the respective pallet. The location information is based on the locating system Location+ integrated in CargoVIS, for which each of the approximately 100 scanners was equipped with an UWB tag. It locates each barcode scanner separately and automatically assigns it to the proper camera group in each section of the hall. In a later search with CargoVIS, the complete movement path of each pallet in the transshipment hall is traceable. The CargoLine partner had CargoVIS introduced primarily in order to be able to completely track about 3,500 handled shipments each day. In the hectic day-to-day business between incoming and outgoing goods, it sometimes happens that individual pallets are parked in the wrong shipping zones - and can not be found later for loading. 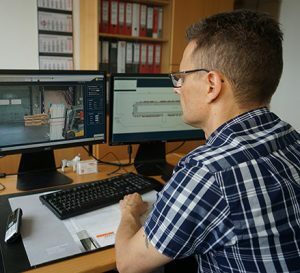 "Given the total hall area of 13,000 square meters and 130 gates, searching for individual pallets without digital support would be far too time-consuming," explains Wegner. Thanks to DIVIS, the hall employees are now completely freed from searching. If a pallet can not be found in the intended location for loading, it is sufficient to hand over the item number to the colleague in the office by phone. 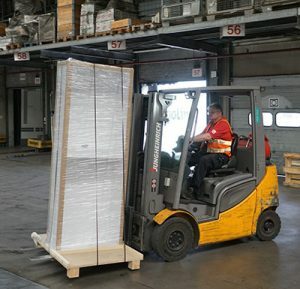 This colleague then uses CargoVIS to detect the image of the pallet at the last reference point plus information on the current location and passes this information on to his colleague. In addition to the saved search time and the innovative volume calculation Wegner also mentions a third reason for the introduction of CargoVIS: "Now we can process complaints from partners, recipients and customers much more efficiently and clear complaints faster." A photo of the pallet from the time of loading or unloading creates clear evidence and does not allow discussions about the question of responsibility to even arise. This applies equally to damage as well as wrong loads or loss reports. To take advantage of this benefit, the image data is stored at Amm for 30 days. "After this deadline, there are no more complaints to be expected, not even in exports," says Wegner, who uses CargoVIS to research around two to five consignments a day. In case he happens to also notice handling errors of the employees, these findings flow anonymously into the next employee training. "This allows us to permanently improve our processes," notes Wegner, who has two inventory scans run during the quieter phases of the day. Thus the experienced logistician creates further reference points, which simplify the later searches and increase the safety significantly. 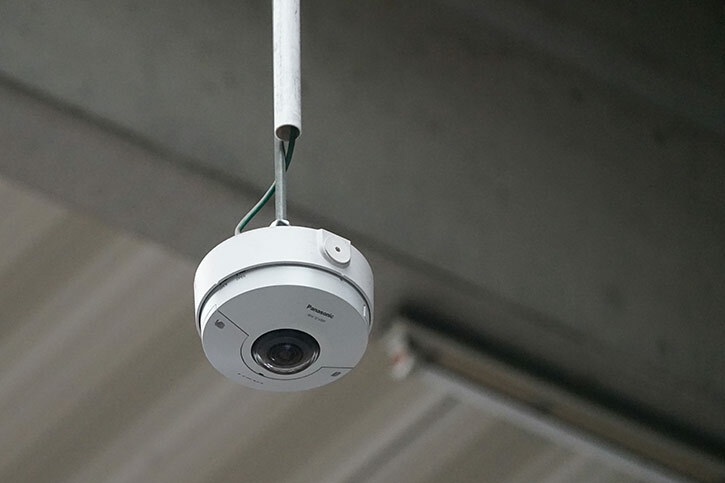 The 23 outdoor cameras, which only the warehouse manager is able to access for privacy reasons, also bring added security. Two of the high-resolution cameras use infrared lighting to send image information that identifies the registration numbers of incoming trucks day and night in all lighting situations. "The main advantage of outdoor cameras lies in their deterrent effect," says Wegner. Damages from vandalism and theft have already only been minor in the past but could be reduced even further by the clever video surveillance. 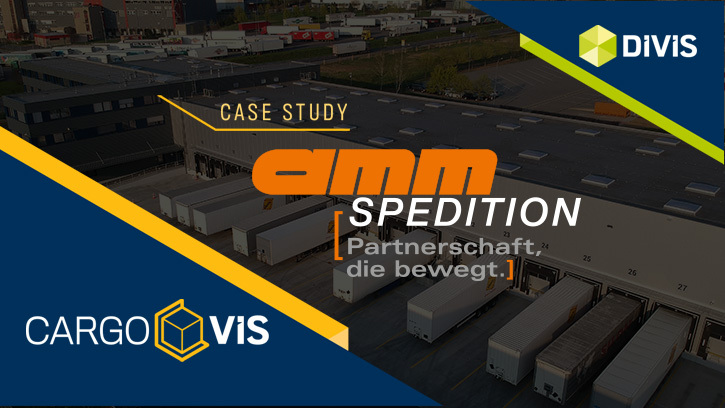 Amm Spedition has realized a number of advantages with CargoVIS. In addition to significantly reduced search times and accelerated loading, the solution also helps with claims and complaints processing. Last but not least, the volume control with Scale+ supports a fair billing of bulky goods. Amm forwarding is an owner-managed logistics service provider based in Nuremberg and with a branch in Konradsreuth. 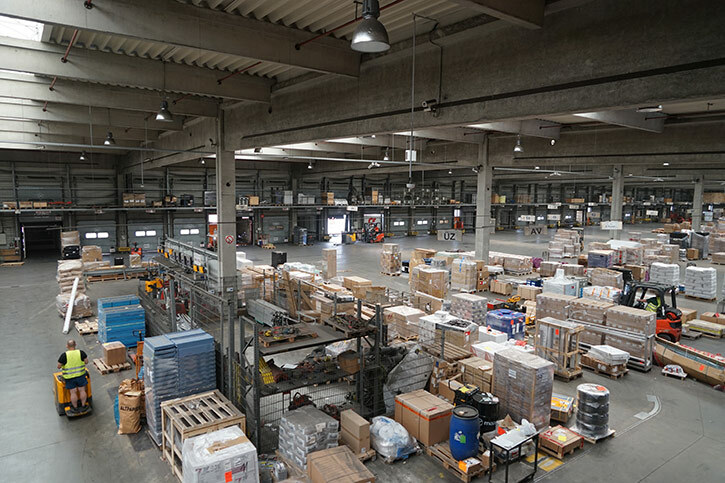 The medium-sized company has a total of 13,000 square meters of handling space and more than 65,000 square meters of storage space. The company owns more than 160 vehicles and more than 400 swap bodies and semi-trailers. An average of 73,000 shipments with a weight of 63,400 tons are handled each month. Amm has been a shareholder and partner of the cargo network CargoLine since 1995 and operates CargoLine’s South Hub in Nuremberg. The company, founded in 1966 by Fritz Amm, today employs 450 people, who generate sales of 70 million Euros. 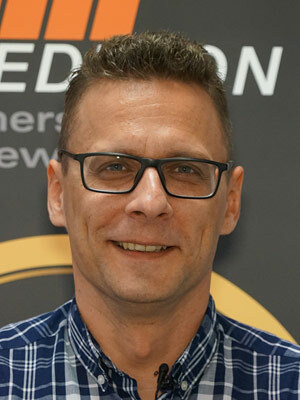 The family business is run by Ralf Amm in the second generation. With our video management software for cargo handling, CargoVIS, we offer you a comprehensive and easy-to-use system solution for the image-controlled search and tracking of palletized goods. Save time and money and let ParcelVIS work effectively for you with image-based consignment search in the transshipment warehouse: Entering the parcel label number is your key to all information on the whereabouts and status of a consignment during all scanned events. Damage documentation via software in goods handling: With DamageVIS, your employees handle all damage quickly and easily in a few automated steps using a predefined workflow. The clear documentation in DamageVIS provides you with the solid proof needed to clarify claims of customers and partners. With StoreVIS, you no longer have to rely on your gut feeling, but can uncover existing optimization potential by means of real key figures. The intelligent StoreVIS solution supports you in video surveillance in goods management. Your return and picking processes are completely covered and cost traps easier to detect. ProfileVIS is a powerful analysis software for video-based material flow optimization that creates transparency. Plan and optimize, for example, your loading processes and the utilization of your hall with ProfileVIS.